forget the fly in my soup, there’s a waiter at my table! If you think I rant and rave a little too much, you’re absolutely right. It’s not about me, it’s about them. I have kept quiet for far too long thinking I was just a fussy character with a streak that wants to have everything just right. On occasion I have actually felt a slight suggestion, just a shade of a hint of an iota of guilt, at telling a fellow to do something correctly – like once at the Chinese restaurant at Centenary Park. I didn’t mean to eat there at all, I’d missed lunch and had sped to the bank, the clinic and then a meeting that ended rather abruptly at about the same time those pangs of hunger almost caused me to faint. Thinking to myself how inappropriate it is that I never get pangs of go-to-the-gym, I found myself at this restaurant, near Efendy’s. Efendy’s itself is owned by a good fellow, Melih. He’s been my pal for a number of years and a few weeks ago I sat down with him over a small problem he was having (you will see it up here later on). Anyway, I decided to try out something new so Efendy’s was out. I walked into one of the other restaurants and interrupted a girl doing her ironing on the bar counter. “Hello, where can I sit that has sockets?” I asked, not realising that I was speaking Ugandan pidgin till I wrote it down just now. (Which is also pidgin). Throwing me a quick glance, she turned back to her ironing without a word. Another fellow suddenly appeared in the doorway leading to perhaps the kitchen and, as soon as he saw me, stopped dead in his tracks. We stood, me silently waiting for the fellow to enter the restaurant properly, her ironing, and him frozen in the doorway looking at me. I gave it thirty seconds of silent watching-each-other-ing, then left for the restaurant next door. These ones call themselves the Mchomo Something. You know the way movies and cartoons claim that when you’re in a desert and about to die of thirst you see an Oasis? I could have sworn there was a BBQ Grill spewing out the sizzling drops of fat that a successful animal sacrifice creates. But as soon as the smiling waitress (20 points for that!) slapped down onto the table that same damn plastic-laminated menu that runs from the other corner of Kisoro to this side of Kotido, the mirage disappeared. I can never bear to touch those menu cards because they always have something sticky on them that you KNOW is not tomato sauce. But I felt a little guilty because this waitress had smiled. I couldn’t just get up and leave. I felt so grateful for that smile that my subcon (I dare you to finish spelling that without fear!) thought it would be rude to just walk away. “Hi. How’s your day? Where can I sit where there is a socket?” I asked with a smile of my own. She pointed at an extension cable balanced off one corner of a table under the TV, the rest of it dangling till the cable that led to…the socket in the wall, to which it was attached by, yes, those two loose wires that are at the end of every major piece of equipment used in public places from the extreme end of Arua to just before the border crossing at Mutukula. Anyway, one look at their electrical installation and I was out, guilt be damned, and found myself at the Chinese restaurant whose name I can never remember and won’t have to since I will NEVER return. The funny thing about this asking for sockets is the way they look every time I pop the question. Like, “Does he want to plug in a kettle or iron his clothes?” I found their surprise odd since in each of the establishments I found a couple of people already tapping away at laptops. Still, they weren’t going to lose me without a fight, and a fellow quickly appeared through a doorway leading to the kitchen, and smilingly moved a table right next to the ice cream fridge so I’d be near my socket. I proceeded to place my order, powered up, and embarked on a spot of work-while-you-eat. As soon as the Spring Roll arrived, so did the first fly. Followed by sixty others. It was like the news had spread that this was the place with sockets for laptop users or something. Frantically buzzing about at my ears and eye lashes, they did their damnest to put me off my food without actually sitting on the damn Spring Roll. The waitress, meanwhile, had disappeared to bring me cutlery, apparently from a neighbouring restaurant. She got back with the cutlery about five minutes after the main course sizzler had arrived. The food, including the spring roll, was now cold because of my frantic hand waving and fly swatting attempts. My laptop? Getting fully charged up, thank you very much, but I couldn’t do any work at all for the bloody houseflies buzzing about. This was the day I met a housefly heavy enough to sit on my keyboard and actually depress the keys hard enough to type something! “Excuse me!” I called out in desperation. The waitress and the smilingly helpful fellow quickly scuttled up to solve my problem with expressions of heavy concern on their faces. Both looked at me in silence but I don’t know what expressions they had on their faces. I don’t think they could see the expression on my face either – there were too many damn flies in the air! The food smelled good, and I was really, really, suffering the kind of hunger that causes health problems. Both opinions were useless to me for their irrelevance in context and whole, but also served to kill my appetite quicker than the actual houseflies had done. “Listen, just get rid of them,” I commanded, realising that the battle to leave would be a little complicated since the food had now been at my table for more than ten minutes. “Okay,” they said in unison, before disappearing to find a solution. Waving my arms and swatting away at everything while shutting down my laptop, it struck me that it had taken them more than five minutes to bring me cutlery yet it was a major restaurant requirement. 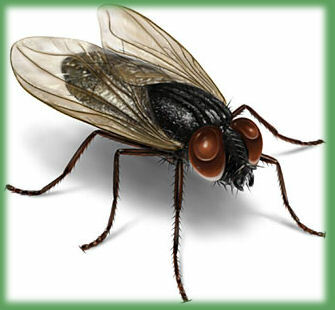 By that calculation, how long would it take them to bring me a never-before-sought solution to this housefly problem? Ten minutes later, food congealed and in need of the intervention of a robust microwave oven, they still hadn’t shown up and the rumblings of my stomach were competing with the buzzing of the houseflies in decibels. 1. Having to wait another fifteen minutes of hunger and fly-swatting, just waiting for them to show up. 2. Having to explain to them that it was incomprehensible for them to expect me to pay for the meal. 3. Having to pay for the damn food, take it home, microwave it a few hours later, then throw it out because apparently flies have different professions that include Deep Sea Diving, evidence of which was in the sizzling chicken dish.